Need to stretch your apps budget? 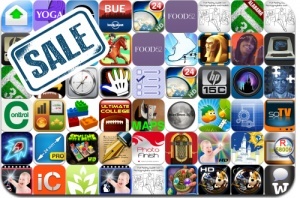 Here are 49 iPhone, iPad and iPod touch apps that just went on sale. This app deal alert includes Horse Racing Winner 3D, Hyperlight, Reiner Knizia’s City of Secrets Skyline, City of Secrets, Hewlett Packard 12C & 15C Calculators, Alabama Smith, Soosiz, Video Touch, Posing App, Basic, AmpliVision, Holiday Recipes & Party Planning Guide, and many others.